The Philippian Jailer: What Did Jesus DO and WHY? Whom to Ask? John's Gospel is very different in tone from the others and it can be hard to match parts of it up with a narrative thread. 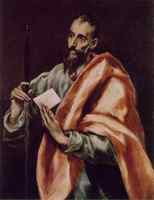 (In the Eastern Church, John is referred to as "The Theologian".) Nonetheless, the account of the raising of Lazarus in Chapter 11 is clearly just before the final events in Jerusalem, and, by Chapter 12, we are explicitly in Jerusalem for the last time. So 11 of the 21 chapters are concerned with the end. What was the response of the disciples? In response to this first announcement, "... Peter took him aside and began to rebuke him." (Mk. 8:32b) And how did Our Lord respond to that? "Get behind me, Satan! For you are not setting your mind on the things of God, but on the things of man." (Mk. 8:33b) The impression one gets here about the understanding of the disciples is reinforced by their response to two further announcements: In the first, just after His Transfiguration and before He began His final journey, the response of the disciples was shortly thereafter to get into an argument over which of them was the greatest. (Mk. 9:30-37) In the second, just before Jericho on the final journey, the response of the disciples was chagrin over a request by James and John to sit at His right hand in His Kingdom. (Mk. 10:32-45) So, taking all this together, it seems hardly unfair to the disciples to say that, "They just didn't get it at all!" Consider the difference that Pentecost would make: Just a short while before, after first hearing that Our Lord "must" go to Jerusalem and die, Peter had rebuked Him. Then, on the eve of Our Lord's death, Peter denied Him. (Mk. 14:66-72) But, on the day of Pentecost, he was able to proclaim, "This Jesus God raised up, and of that we are all witnesses. Being therefore exalted at the right hand of God, and having received from the Father the promise of the Holy Spirit, he has poured out this that you are seeing and hearing." (Acts 2:32,33) As for the effect that the passage of time, and the teaching of the Spirit would have on Peter's understanding, one has only to read his two letters in the New Testament to see that. What these men were able to do through the preaching of the gospel and the work of Christ's Spirit was a wonderful fulfillment of His promise to His disciples just before His death: "Truly, truly, I say to you, whoever believes in me will also do the works that I do; and greater works than these will he do, because I am going to the Father. .... And I will ask the Father, and he will give you another Helper to be with you forever." (John 14:12, 16). The writings they left behind are a priceless treasure. We should view what we see there as Our Lord's post-Penteconstal message to us. At the beginning of Luke's "Acts of the Apostles", he told Theophilus that his Gospel had "dealt with all that Jesus began to do and teach" (1:1b). The inference is that the Book of Acts has to do with what He continued to do and teach through His apostles. Some of us may have heard Augustine's dictum in regard to the Old and New Testaments that, "The New is in the Old concealed, the Old is in the New revealed". I'd like to suggest an expansion of that to the relationship between what we find in the Gospels, especially the Synoptic Gospels, and what we find in the Apostolic writings of the New Testament: The full meaning of what Christ came to do is, for the most part, concealed in the Gospels, because His church was not yet empowered by His Spirit to understand it. It was left to the teaching of His Apostles after Pentecost to fully reveal it. That's pretty much the opposite of the view that was proposed by Anonymous, but I think it's the right one. 2Ti 3:15 and that from childhood you know the Sacred Writings, the ones being able to make you wise to salvation through faith, the [one] in Christ Jesus. 2Ti 3:17 so that the person of God shall be fully qualified [or, perfectly fit], having been completely equipped for every good work. That says the Older Covenant (Old Testament) is literally God's Word but what about the New Covenent? Just as the Word (Yeshua) became flesh, God’s Word was also made into writing. Just as much as Yeshua was, and is, alive, so is God’s word the scriptures. 1Th 2:9 For you* remember, brothers [and sisters], our labor and toil, working night and day [so as] not to be a [financial] burden to any of you*, we proclaimed the Gospel of God to you*. 1Th 2:12 and imploring [you*], in order for you* to walk about [fig., conduct yourselves] in a manner worthy of God, the One calling you* into His own kingdom and glory. 1Th 2:13 For this reason also, _we_ constantly give thanks to God, that having received [the] word of God [which you*] heard from us, you* accepted [it], not [as the] word of a person, _but_ just as it truly is, [the] word of God, who also supernaturally works in you*, the ones believing. There's so much more to say ... really. We are blessed with a written record of much of what Jesus did during His brief ministry while in the flesh. However, I contend that God's Word should serve as a foundation for all Believers to investigate what Jesus is doing now. Instead of the popular WWJD I ask WIJD (What is Jesus Doing)? That's where I desire to be.